Garbage disposers can be subject to several common problems. They can jam up when objects bind up the impeller blades inside the appliance. The drain fittings can loosen and cause leaking beneath the sink. 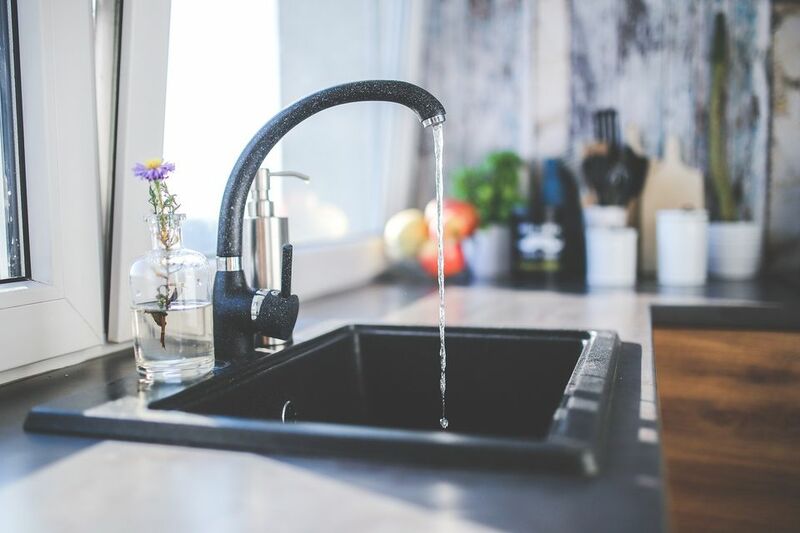 Or, less commonly, the drain connecting the garbage disposer to the rest of the sink's drain trap assembly can become clogged, and cause water to back up into the sink basin where the disposer is installed. In a double-basin sink, when it's only the disposer basin that backs up with water, the likelihood is that the drain fitting on the disposer is clogged. Your garbage disposer is a workhorse appliance in your kitchen and one often taken for granted. Your disposal will have no problem grinding most food waste, but it's what happens after the grinding that may cause a clog. The reason for a clog in a food disposal has to do with how ground food waste reacts to water or lack of water after the disposal unit grinds it up and sends it on its way toward the drain line. When a garbage disposer clogs, you will often find the problem in the trap pipe located on the waste discharge side of the disposal. The poor or blocked drainage can be caused by several different reasons, as discussed below. Lack of flushing water. Not putting enough water down the disposal when it's grinding is a sure way to get a clog. Without sufficient water, the waste can't be flushed through the pipes and will quickly build up. Once a full blockage occurs, water can't flow at all. Grinding egg shells or coffee grounds. These items are a bigger problem than you might imagine. When ground by a disposal, egg shells and coffee grounds create very tiny granular waste that will stick to any sludge found in the pipes and quickly create a clog. Grinding potato peels. Potato peels are notorious clog makers. Once ground up, they form a starchy paste similar to mashed potatoes that will quickly clog the drain. Grinding banana peels. These are a similar problem to potato peels, except they also add stringy fibers to the mix. If your disposal is draining very slowly or not at all, the problem is most likely in the drain trap—the P- or S-shaped plumbing fitting located right after the disposal discharge pipe. Place a catch bucket beneath the disposal's drain trap. Use channel-type pliers to disconnect the slip-nut fittings on the drain trap, and remove the trap. It's not uncommon for water to spill out of the pipes as you disconnect them. Check for clogs or obstructions in the trap fitting. Most often, clogs will occur in the sharp bend of the trap. A small scrub brush is the most effective way to dig out any debris. If the clog isn't in the trap, then it may lie in the drain arm that connects to the branch drain pipe going into the wall, or may even be in the vertical drain pipe inside the wall. Clearing this kid of clog calls for clearing the obstruction with a sink auger. Reassemble the drain trap fittings, and run water down through the disposal for several minutes to flush any loose debris through the drain system.